Photii Bibliotheca.--Fabvic.Bibl. Graec. 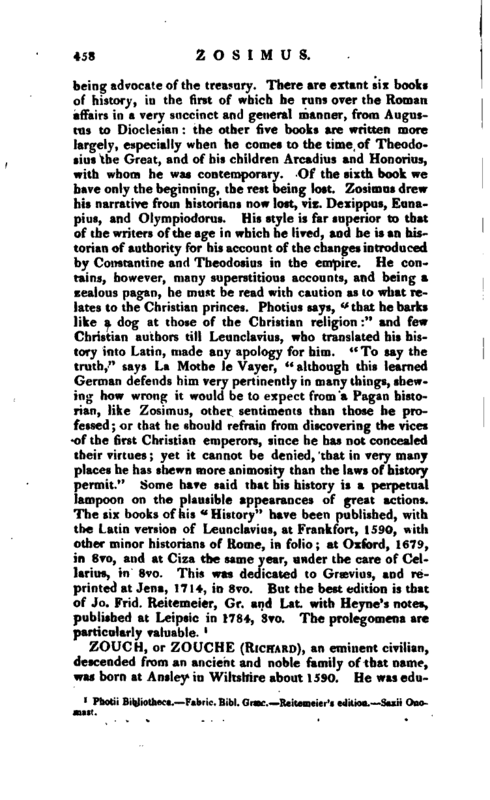 Reitemeier’s edition. —Saxii Onomast. | educated, on the foundation, at Winchester school, whence in 1607 he was elected to New college, Oxford, and chosen fellow in 1609. Having studied the civil law, he took his bachelor’s degree in that faculty, in June 1614, and in Jan. 1618 was admitted at Doctors’ Commons, where he became an eminent advocate. In April 1619, he commenced LL. 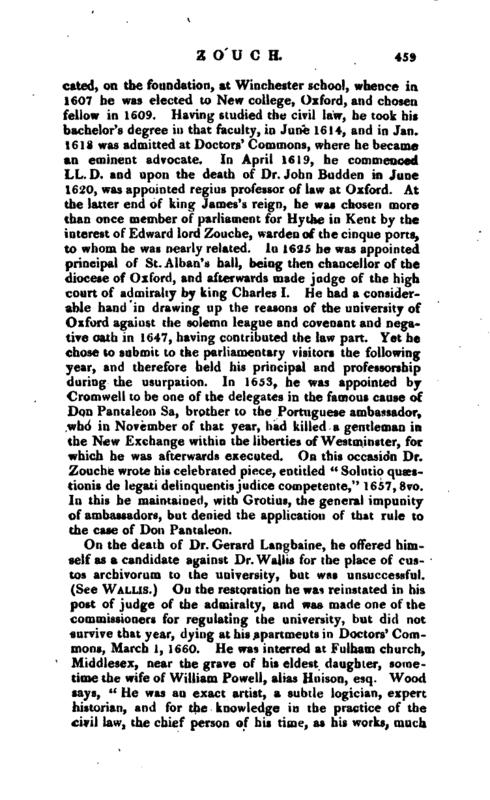 D. and upon the death of Dr. John Budden in June 1620, was appointed regius professor of law at Oxford. At the latter end of king James’s reign, he was chosen more than once member of parliament for Hythe in Kent by the interest of Edward lord Zouche, warden of the cinque ports, to whom he was nearly related. In 1625 he was appointed principal of St. Alban’s hall, being then chancellor of the diocese of Oxford, and afterwards made judge of the high court of admiralty by king Charles I. He had a considerable hand in drawing up the reasons of the university of Oxford against the solemn league and covenant and negative oath in 1647, having contributed the law part. 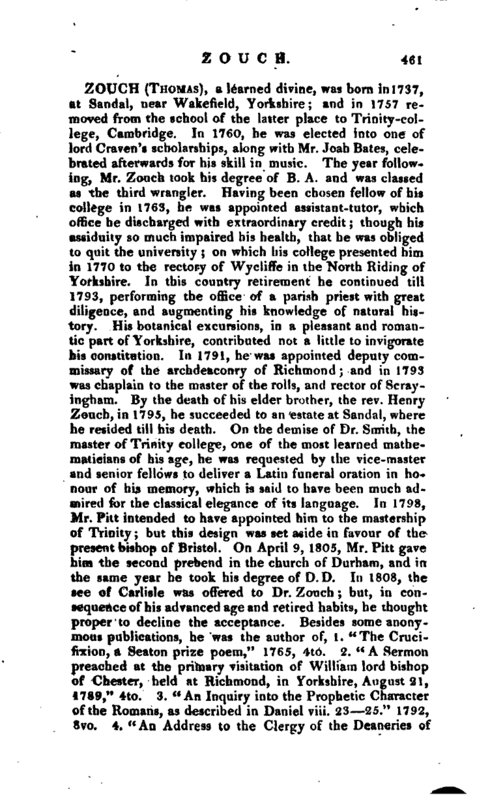 Yet he chose to submit to the parliamentary visitors the following year, and therefore held his principal and professorship during the usurpation. In 1653, he was appointed by Cromwell to be one of the delegates in the famous cause of Don Pantaleon Sa, brother to the Portuguese ambassador, who in November of that year, had killed a gentleman in the New Exchange within the liberties of Westminster, for which he was afterwards executed. On this occasion Dr. Zouche wrote his celebrated piece, entitled “Solutio quaestionis de legati delinquents judice competente,” 1657, 8vo. In this he maintained, with Grotius, the general impunity of ambassadors, but denied the application of that rule to the case of Don Pantaleon. 1 Ath. Ox. vol. It. Biog. Brit. 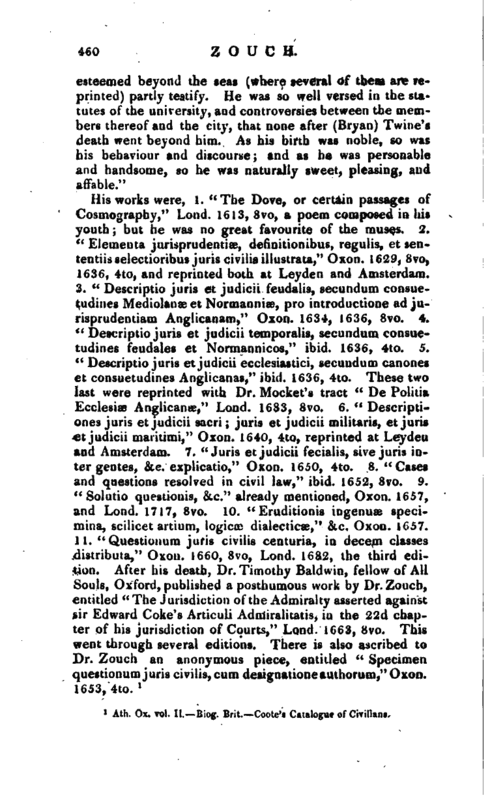 Coote’s Catalogue of Civilians.